I’m calling these breakfast cookies because they are a cross between a cookie and a muffin top and I totally ate them for breakfast. By naming them breakfast cookies I’m giving you permission to do so as well! I’m nice like that. Plus there are oats tucked inside there so it is basically begging to be eaten for breakfast. Nothing fancy here- just 4 ingredients that you probably already have in your pantry: flour, eggs, Nutella, and oats. I used whole wheat flour because I’m super healthy like that. Also because I may have eaten my weight in Mega Stuffed Oreos. Need some more Valentine’s Day Inspiration? 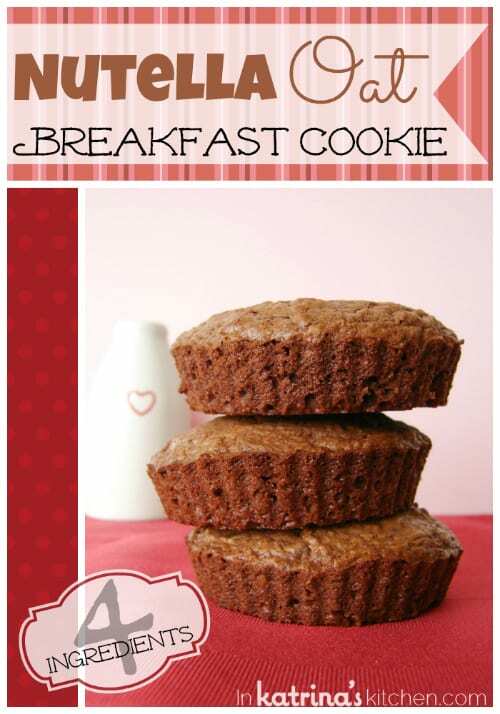 Come take a peek at my I Eat Valentine’s Pinterest Board and pin with me! All you need is 4 ingredients and you have a delicious recipe for breakfast cookies. Packed with Nutella and oats you'll be full until lunchtime! In the bottom of a medium bowl (or stand mixer) beat together Nutella and eggs. Gradually stir in flour and oats until combined- makes a think batter. Spray the bottom a large (jumbo) muffin tin and drop about 3 Tablespoons batter into each well. If you don't have a jumbo sized muffin tin you can make these in a regular muffin tin but you will need to adjust the baking time. Start with 15 minutes and check center with a toothpick (toothpick should come out clean). My kids have a long weekend, so I think I’ll make these for breakfast for them. I can’t help but wonder what these would taste like with my favorite spread, though – Biscoff! Have a Happy Valentine’s Day! Nutella? Count me in for a dozen! Omigoodness this is my kind of breakfast!!!! I would love eating these for breakfast! Four ingredients to make these babies?? HAVE MERCY. I love dessert for breakfast! I have all of the ingredients on hand… I might just need to give these a try! Desserts for breakfast – delicious (also the name of a fabulous blog – LOL). Oats and nutella – YUM! These look delectable. Nutella and oats? For breakfast? In a cookie/muffin top? I’m there! I also like how they are crackly on top, just like brownies. Nom! 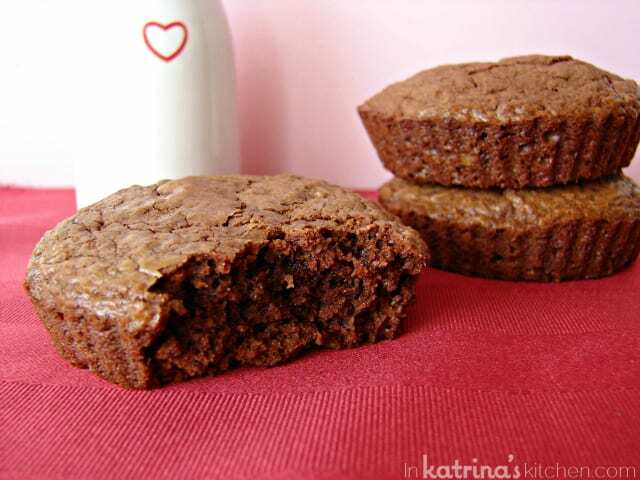 Katrina, your photos are terrific and thanks for the easy peasy recipe! I am all for cookies for breakfast! Especially thick and delicious like these! Yum! I don’t have Nutella but I do have Biscoff – maybe I’ll give that a try! pinch me. is this real life??? 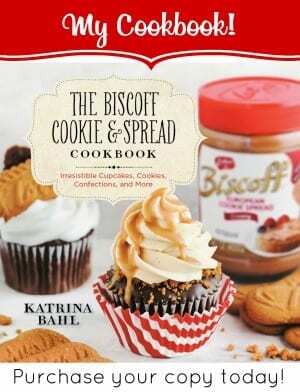 Katrina, you just created my dream come true easy cookie recipe! hearts to you <3 Happy V-day! I love that there are only four ingredients…I can totally go for these right now! 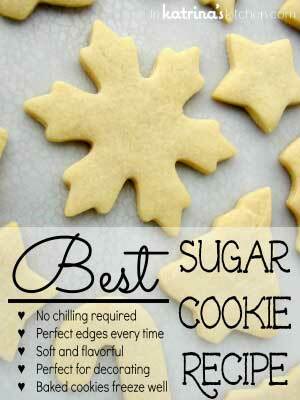 4 ingredient cookie? I LOVE IT! And I can have it for breakfast? You, my friend, need to move in with me! These sound delicious! One cup of Nutella~YUM! Yum, these look delicious !! I love these!!! I’m all about cookies for breakfast! You ARE nice like that. And I am pinning these beauties, despite not being able to really eat them! Love ya! Seriously 4 ingredients…or was it 5? No matter these look amazing and we are never ever never ever ever……did I say never with out Nutella in our home! Our motto is everything taste better with Nutella on it! 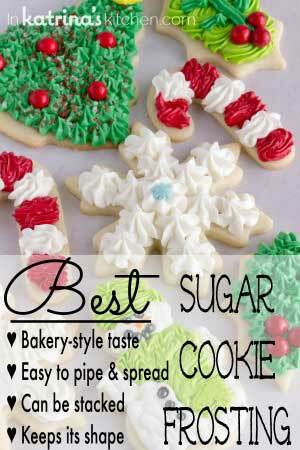 Cookies for breakfast sounds pretty good to me! This is my kind of breakfast. Love the new look. Cookies for breakfast? This is awesome!! 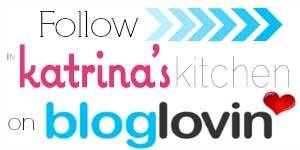 I want to live with you, Katrina! Yep. I will take two please 🙂 I love the addition of Nutella. I could eat that stuff with a spoon! I love that crackly top! They sound/look fantastic! If you label it breakfast, its breakfast. Besides it has oats in it, totally healthy! Did I hear someone say cookie? I’ll use any excuse to eat a cookie for breakfast. These look wonderful! 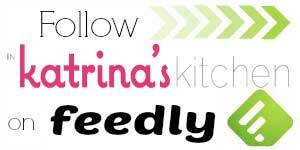 This is an awesome recipe Katrina! I love this! Wow – just 4 ingredients (and one of them is Nutella)! They look great! I made them and loved them. Mine were a little overcooked so I am going to adjust the cooking time next time but they were fabulous! I just posted this on my blog today. It makes me want to make them again!!! YUM! We love nutella but would peanut butter work also. ? use banana instead of eggs and it will make it even more of a breakfast treat! Can’t wait to try these!